On Friday, August 8, 2014 sixty cast members and friends toured the Ingham and all said they wanted to return to spend more time onboard. 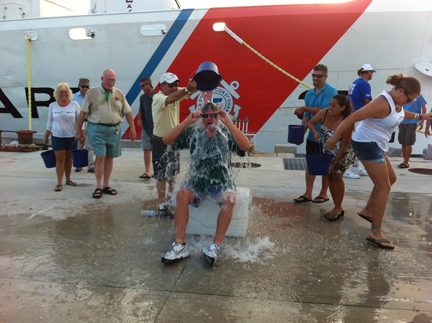 Andy Kirby, Cruise Ship Liaison Sales Manager for Historic Tours of America, had been called out for the ALS Challenge. What better place to hold this event than in front of the Coast Guard Cutter Ingham. Everyone fought over who would get to participate in the “21 bucket salute”. Those lucky people who were chosen had the privilege of dumping a bucket of ice water over Andy’s head. He handled it like a “Rock Star”. It was a fun ending to what started out as a wonderful tour on the Ingham. Andy Kirby being dumped with ice water during the ALS Ice Bucket Challenge. Posted in , Key West | Comments Off on 21 Bucket Salute! Old Town Trolley Tours of Washington is not a company to turn away from a challenge, so when Old Town Trolley Tours of Key West challenged us to the ALS Ice Bucket Challenge, not only did we embrace it, we brought in the big guns. Our President Edwin Swift, III and COO, Edwin Swift, IV came up to DC and got doused with the rest of us! You are currently browsing the Old Town Trolley Tours Blog blog archives for August, 2014.